Thank you for purchasing Chromium Store Theme. This manual will show you how to work with your theme, how to edit it and create a "live" website of your dream. Learn how to configure settings for Scribbler, such as your syntax highlighting preference and the default saving folder location. Please, make sure to use original WordPress copy from wordpress.org website. Do not use the pre-installed copy provided by your hosting company. Once downloaded, unzip the compressed folder to see the structure of package. 1. 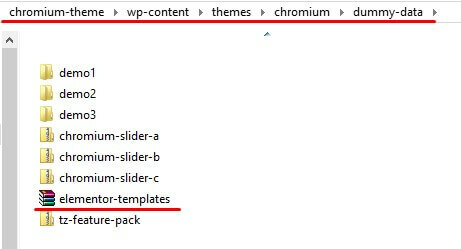 Go to THEME folder, there you will find a packaged Chromium.zip folder, upload the package to wp-content/themes/ folder of your WordPress and uncompress it. Once uncompressed, the theme can be activated. 2. Go to backend section of your WordPress site (http://link_to_your_site/wp-admin/), then go to Appearance -> Themes and activate the Chromium Theme). 3.When you click on "Activate" button to activate Chromium Theme, you will see the a notice offering you to install required and recommended plugins. Click "Begin installing plugins", on the screen that appears, next select the plugins you want to be installed, pick "Install" in Bulk Actions select box and click "Apply" button. For optimal user experience install and activate all recommended plugins. Warning! It is recommended to install sample data on a clean WordPress installation! Otherwise full or partial data loss may occur! 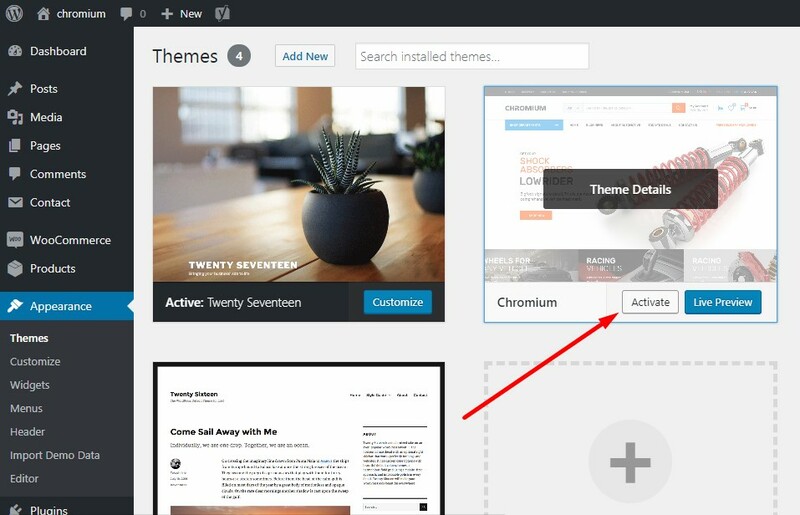 After you activate your theme and install required plugins you may want to install sample data to make your site look like Live Demo of our theme, which can be found here: http://chromium.themes.zone/. and wait till installation is over. The process may take several minutes. As you can see, once you entered "Import Demo data" area, there will be 3 available demo datas: Chromium Demo (Local Shop), Chromium Demo (Marketplace), Chromium Demo (Supermarket). Import needed version. You should know that there is enough just to import only 1 Demo data. Other templates come with theme package (dummy data directory) and can be imported anytime via Elementor's Import tool. 3. Import the demo slider (if needed). To import the demo slider in your WordPress dashboard go to Slider Revolution -> press the Import slider button. Important Notice: Revolution Slider plugin is currently removed from the theme package. Please create a ticket here with a title "Revolution Slider" to receive your copy. We apologize for the inconvenience and are working on new automated ways of distributing the plugin. Press choose file and exact demo slider from the theme package you downloaded, or you can download it here separately, and press import. Make sure your recently imported slider shortcode matches exact one on the home page of your site. Most likely it won't. By default our demo home page is looking for slider with this shortcode [rev_slider alias="chromium-slider"], imported slider will have a different shortcode. So you should to go to your imported slider settings, find its shortcode, then go to editing your demo home page and change to imported one using Elementor. and change the slider's shortcode you can find at the left side of your screen , edit shortcode. Then hit Apply and Update buttons. The slider should appear on your home page now once you refresh it. We strongly recommend you to create a child theme and use it for customizing Chromium. This way you can update the theme and it's plugins without fear of loosing implemented changes. You can download the blank child theme we created for you here. It is recommended that you always update your theme to the latest version. When a new version of the theme is availabe Envato will usually send an e-mail notifictaion to you on this matter. Theme update information will also be bublished in the theme's comments section on themeforest. The latest changelog file is also going to be available online. If you made customization in the theme you want to update, make sure that customization is going to be moved to the new updated version of the theme. Otherwise you may loose it. If the customization was significant you may want to use the help of an experienced developer to properly move it to the updated theme version. Activate it (or child theme, if you use one) in your WordPress dahsboard. The header of your site is typically the first thing people see, therefore it'd better be good. Luckily Chromium theme offers you a magnificent and informative header which will make your site stand out among others. Search widget. Search functionality was added with the help of additional Woo Ajax Search. Info block. Mentioned content is created with simple HTML, and located within Custom HTML widget. Cart widget. Attached custom TZ Cart for Woocommerce widget is unique and was developed/styled for cart purpose in Chromium theme. Usually main menu is the most important navigational element of a website. WordPress includes easy to use mechanisms for creating and maintaining navigation menus. It can be accessed at Appearance -> Menus section of your WordPress dashboard. When Demo Data installation procedure will be finished,set Demo Menu and edit it according to your needs. If you want to edit menu appearance or color scheme, just follow this link https://www.megamenu.com/documentation/installation/ and stay informed with plugin's official documentation. In this case all custom menu features will be applied to your current menu,but mega menu should be created from the very beginning. In WordPress, you can write either posts or Pages. Pages are for content such as "About," "Contact," etc. Pages live outside of the normal blog chronology, and are often used to present timeless information about yourself or your site - information that is always applicable. If you plan on using Yoast SEO Plugin on your site, Chromium theme allows integration of Yoast breadcrumbs on all pages except shop. 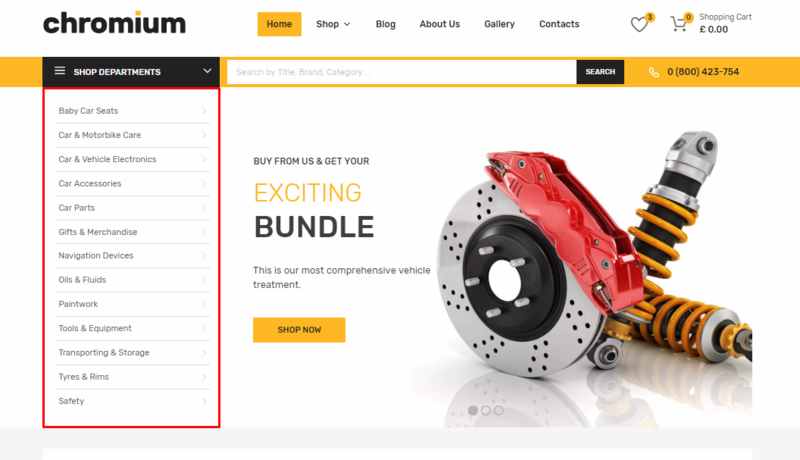 Shop pages are using standard WooCommerce breadcrumbs. In Chromium WordPress theme ecommerce functionality is introduced by WooCommerce plugin. With endless flexibility and access to hundreds of free and premium WordPress extensions, WooCommerce now powers 30% of all online stores - more than any other platform. In Chromium blog is a part of your website where you can maintain an ongoing chronicle of information. It consists of the main blog page - an archive of blog entries presented as a list of entries in reverse chronological order with thumbnails and pagination, and the actual blog entry pages, on which you can see full content of each particular blog entry. Blog entries can be commented by your site's visitors which gives you additional opportuniry of interacting with your existing and potential customers. Blog is a great place to deliver your message to the world, show the best sides of your business, and attract new customers. And since we have created great designs and layouts for your blog entries to look gorgeous, you just need to come up with some excellent content to type in that blog. Technically, footer represents the bottom section of a web page which contains information like copyright notices, social links etc. It also often contains code and scripts that a WordPress theme developer would want to include in the page but after loading the rest of the page content. In Chromium all scripts are included in the theme footer. Footer Col#1 includes TZ Contacts & TZ Social Icons Search widget. Both widgets are unique and were developed especially for Chromium theme. Footer Col#2 includes Meta Information widget. Footer Col#3 includes Pages widget. Set "sort by" parameter and feel free to fill out "EXCLUDE" field with IDs of pages that you want to ignore. Footer Col#4 includes MailChimp & TZ Payment Icons widget. Second one is unique. In Chromium footer also contains a widgetized area with multiple columns that you can use to add WordPress widgets. Chromium has a powerful set of theme options on board to make your user experience pleasant and to provide you with effective customization tools. 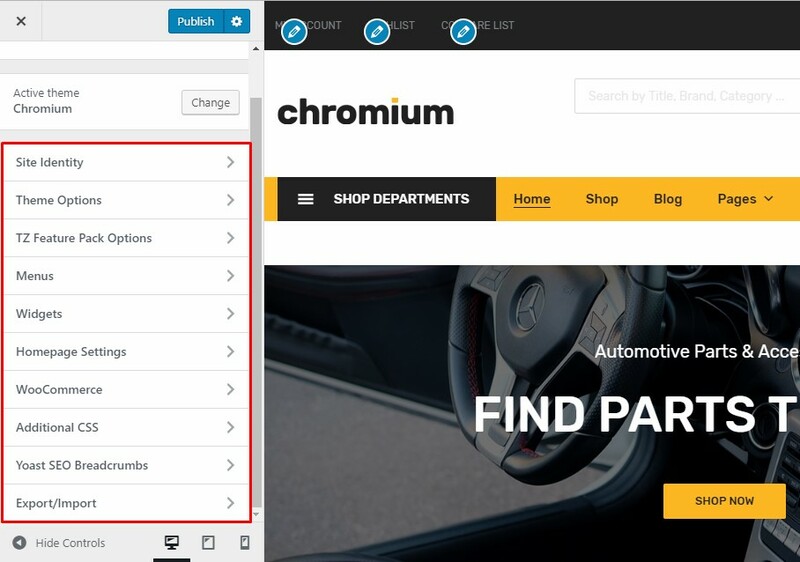 One of importan peculiarities of Chromium theme options is that they are available through WordPress Customizer and will change depending on the page you are customizing at the moment. 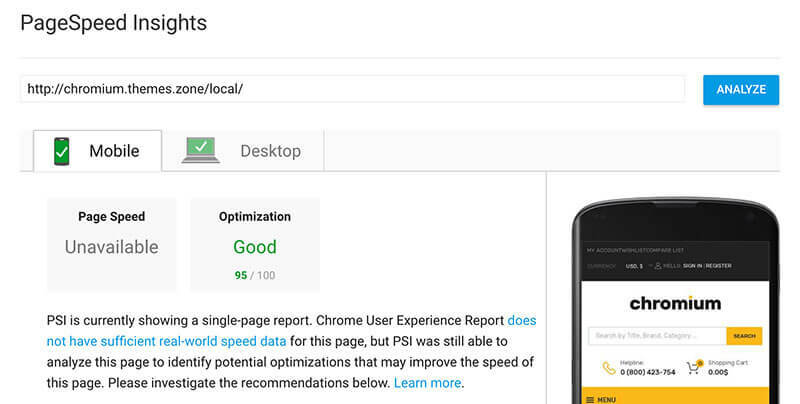 Chromium theme options facilitate control over certain crucial areas of your Chromium-based website. Theme options can be accessed in your WordPress menu at Appearance -> Customize. 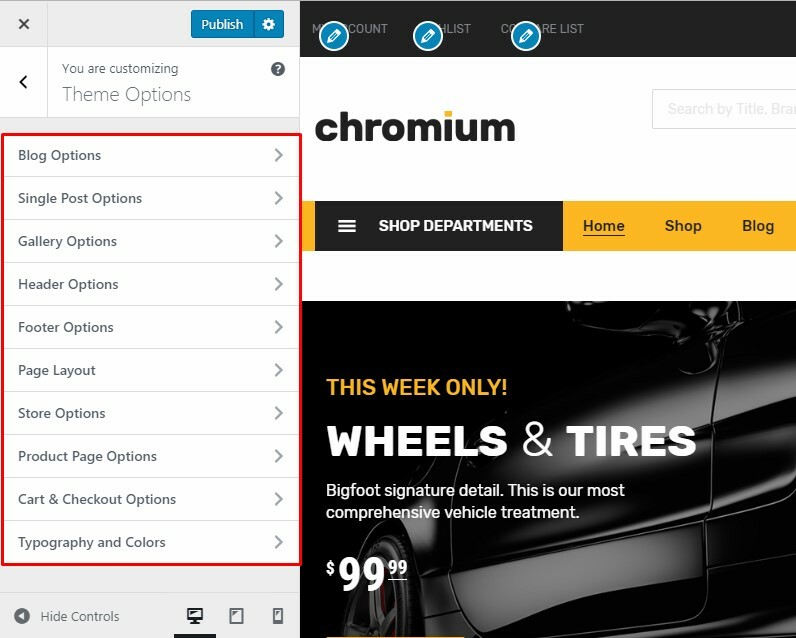 Chromium theme options consist of 10 sections: Site Identity , Theme Options ,TZ Feature Pack Options , Menus , Widgets , Home Page Settings, WooCommerce , Additional Css , Yoast SEO Breadcrumbs , Export/Import. And 10 additional theme options: Blog Options , Single Post Options , Gallery Options , Header Options , Footer Options , Page Layout , Store Options , Product Page Options , Cart and Checkout Options , Typography and Colors. This set of theme options allows to manage blog page elements within customizer. This set of theme options allows to manage your single blog post page elements within customizer. Enable Output of Related Posts selector allows you to enable/disable output of related posts in the bottom of single post page. Enable PREV/NEXT navigation selector allows you to enable/disable output of PREV/NEXT navigation in the bottom of single post page. This set of theme options allows to manage your Gallery page elements in customizer. Add Filter Navigation selector allows you to enable/disable output of filter navigation on the top of Gallery page. Full-width Gallery Container enables/disables full-width container for Gallery page. Horizontal/Vertical Gap controllers for Images allows to control distance between images on Gallery page. Filter Navigation Colors allows recolor filter navigation buttons on Gallery page. Custom Header Background contains Enable/Disable switcher , Background Image , Background Color , Header Font features. Header's Top Panel contains Enable/Disable switcher , Background Color , Text Color Top Panel features. Custom Footer Background contains Enable/Disable switcher , Background Image , Background Color , Footer Font features. Pre-Footer Shortcode Section allows to fill out needed shortcodes to be displayed straight before footer. All of these features give an opportunity to specify position of sidebar on exact pages. Disable/Enable sidebar output at all. These theme options allow to manage Shop settings in customizer. Qty of products visible on shop page , Default products view , Product Listing Hover Style , Product Sale Badges Style , How many products to show per row on mobile devices , Enable/Disable Catalog Mode options are included. Chromium theme has 3 product listing hover effects to give you choice that suites your content. These set of theme options allows to manage Single Product page settings in customizer. Product Page Background color , Woocommerce Gallery Slider , Product Page Layout , Woocommerce Gallery Lightbox , Woocommerce Gallery Zoom , Product Variations Grid View , SHARE buttons on Single Product page , Enable/Disable Up-Sells/Related products output under the tabs options are included. 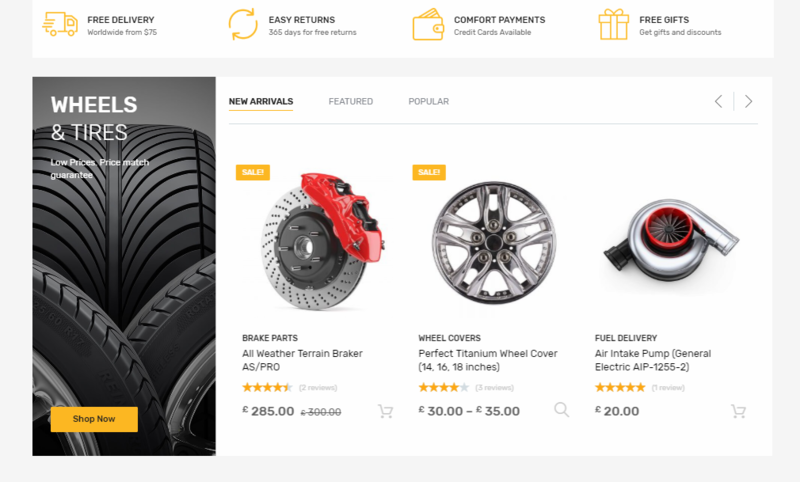 Single Product page layout options includes 3 unique features to increase your site’s conversions rates. 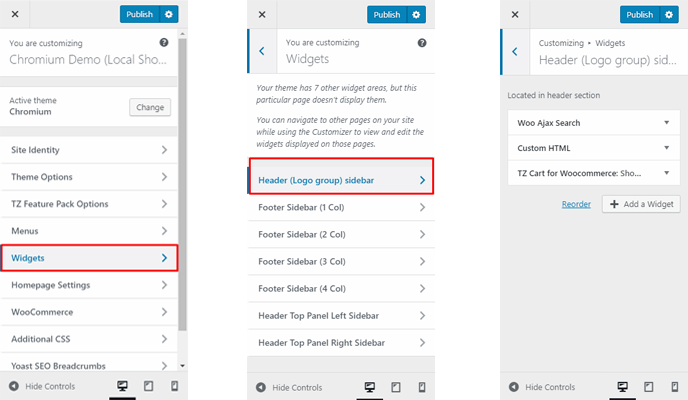 These set of theme options allows to manage Cart & Checkout pages settings in customizer. It includes Add widget area instead of Cross-Sells products , Enable Grid Layout for widgets. Option blocks have Font family dropdown selector with Google Fonts in it, a variant of the font - regular, italic, different font weights, font size, line height, letter spacing options, text alignment, text transform, text color options. These options provide you with supreme control over fonts on your site. Our coders find drag & drop Elementor Page Builder really well-coded and decided to build all theme content on it. This user-friendly environment allows creating good-looking pages with needed layout. Or follow: wp-dashboard-->pages and push "edit with Elementor" within needed page. Once you have entered Elementor, additional admin panel will appear on the left side of your screen. 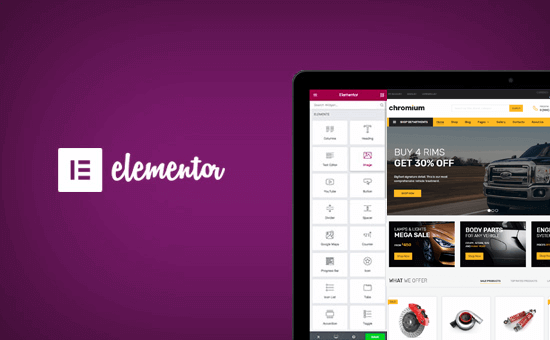 First 2 steps include "add section" and "set page structure"
Elementor allows you to manage number of content widgets and content elements, which you can place anywhere on the page and relocate them according to your needs anytime via full drag-and-drop support. Default Chromium theme functionality is equipped with more than 20 unique custom elements & widgets. Just drag element and locate wherever you want, save changes and move forward. All default Woocommerce and WordPress widgets are included as well. There are several methods to create a translation of a WordPress theme. To translate Chromium to another language (Localization) you will need to create a custom translation. We recommend using PoEdit to create a custom translation for Chromium. Translate necessary text strings. You will be able to come back and edit your translation later. Upload resulting files to wp-content/languages/ in your WordPress installation. To create a website which has several languages and cureencies use WPML. Use Merge + Minify + Refresh plugin. You can donwload it here. Use WP Super Cache plugin. You can donwload it here. Use a CDN for your site. Learn more about CDN for WordPress. Your hosting must be a good one and support at least one of php caching solutions to reduce server response time. Chromium theme comes with a minimum of 6 months of included support which also can be extended. It means that whenever you have a question on theme functionality during the support period you can create a personal ticket at https://themeszone.freshdesk.com and receive qualified help from our support team. At Themes.Zone we believe that nothing should stand between the Code and your Business. That’s why we do our best to meet the highest support standards and make your theme experience as smooth and pleasant as possible. We care about you and what you do, because we think that your success is our success too. That is why our support team is trained to treat your messages with proper respect and attention. Although we do our best to satisfy all of our customers' needs, certain things naturally fall beyond the scope of our support. We are not able to provide support on code customization, third-party plugin integration, and server-related issues. Theme/demo data installation is also not included in support. We'll generally provide support on using theme's features or problems with the theme only. You should understand that sophisticated tasks like changing theme's functionality, achieving 100% third-party plugin compatibility, adding new functionality to the theme, changing theme layouts beyond the existing options, and other may require advanced web development skill set. Please note that theme support does not include services to modify or extend the item beyond the original features, style and functionality. For customization services that will help you tailor the item to your specific requirements, it is recommended that you contact our support team to see if we are going to be able to privately offer you paid customisation services. You can also hire a third-party developer to customize the theme for you. Chromium is a Premium WordPress theme created by ThemesZone.